Santa Cruz is the largest port on the island of Tenerife of Spain's Canary Islands, off West Africa. It is known by two names - Santa Cruz and Santa Cruz de Tenerife. It's dominated by Mt. Teide, a dormant volcano that is Spain's tallest peak. Tenerife may be best known for its Carnaval de Santa Cruz, a huge pre-Lent festival with parades, music, dancing and colorful costumes. The island has many beaches (with sands from yellow to black) and resort areas, including Los Cristianos and Playa de las Americas. The island, which lies at the same latitude as the Sahara Desert, enjoys a warm tropical climate with an average of 18-24C (64-75F) in the winter and 24-28C (75-82F) in the summer. It has a high annual total of days of sunshine, and low precipitation in all but the mountain areas. For swimming and sunbathing, the best time is from May to mid-October, although it is quite comfortable year round. The original inhabitants of Santa Cruz were primitive cave-dwellers called Guanches who arrived from North Africa around 200 BC. Tenerife was the last island to fall to the Spanish in 1496 and subsequently became an important trading center. As such, it was subject to invasions by marauding pirates and, in 1797, from the British in the famous battle of Santa Cruz. In 1821 Madrid declared Santa Cruz de Tenerife, by then the island's main port, the capital of the Canaries. While in port you will have a plethora of options for exploration and discovery. The most popular is standing in awe beneath the looming Mt Teide volcano and explore the lava-sculpted landscapes of the UNESCO-listed Mt Teide National Park. You can explore the idyllic island of La Gomera, immerse yourself in the breathtaking scenery of rural Masca and Teno, try your best to reel in a tuna or marlin on a chartered fishing boat, or enjoy the blissful relaxation or adrenaline-pumping thrills of Siam Park, Tenerife's new water kingdom, already established as one of the best water parks in the world. If nature calls, Loro Parque is home to orcas, dolphins, parrots, penguins, sea lions, parrots, pelicans, gorillas, chimps, tigers, and even sharks! You can get lost in nature, relax on the beach, climb Teide, go shopping, see a show, walk the old town cobbles, have fun at a theme park, or invigorate yourself with energy from an endless selection of activities. However, don't leave Santa Cruz de Tenerife without trying the food. Sit on a terrace with sea views and taste the local shrimp: A truly mouthwatering experience! Round route on Santa Cruz City with on/off privileges for 24 hours! Air-conditioned buses with WiFi and wheelchair access! Easy to use system map of Santa Cruz City! Audio narration on the bus available in 7 languages! A total of 11 Bus stops at the must-see sites! Entrance fees included to the Botanical Garden and the Museum of Nature and Man! Complimentary bus ticket to Teresitas Beach and La Laguna! 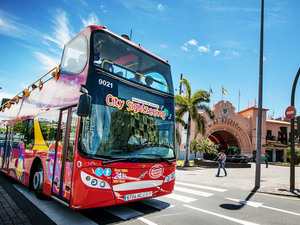 Hop-on the double-decker bus to really make the most of your visit to Santa Cruz, the capital of Tenerife. Sit back and enjoy a city so rich in history and culture. Hop-off whenever you want to explore or stay on board for some great sightseeing. Freed guided walks included!